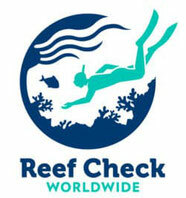 REEF CHECK SPOTLIGHT: CORAL- WHAT DOES IT REALLY MEAN? 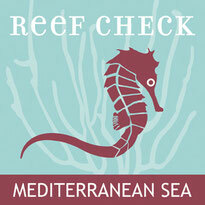 - Welcome on Reef Check Mediterranean Sea! REEF CHECK SPOTLIGHT: CORAL- WHAT DOES IT REALLY MEAN? When people use the word “coral”, they are generally referring to a group of organisms belonging to the phylum Cnidaria, Class Anthozoa and Order Scleractinia. These are the hard corals that build coral reefs. Although this meaning is widely known all over the world, if we go back in time we can find that the term “coral” comes from the word “korallion”, which in ancient Greece was used to describe the precious red coral (Corallium rubrum - Linnaeus, 1758), a species found only in the Mediterranean Sea and in some areas of the Atlantic Ocean. Today, you only need to consult the English definition of "coral" on Wikipedia, to find that there is no reference at all to the red coral. Although both types of coral belong to the same class Anthozoa, the differences between them are remarkable; what is undeniably evident is their incredible diversity. Scleractinian corals, for example, are in the subclass Hexacorallia. Corallium rubrum is instead an Octocoral (subclass Octocorallia), much more related to the sea fans, even though it has a skeleton of calcium carbonate rather than gorgonin (the tissue protein that gives the gorgonians their notable plasticity). Coral reef builders flourish in tropical, shallow, sunlit areas. C. rubrum lives instead at greater depths, in sheltered areas or in caves. 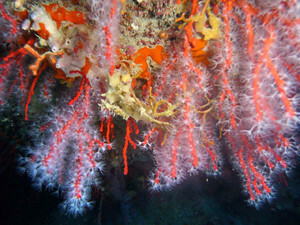 Furthermore the red coral is also a key component of the Mediterranean “Coralligenous”, a complex community where red coral and sea fans coexist. Together, with many other species, they form a habitat that has some of the greatest biodiversity in the entire Mediterranean Sea. Hard corals have developed a symbiotic relationship with zooxanthellae, which give them a variety of colors. Corallium rubrum does not have symbiotic algae and its extraordinary red color is related to pigments inside the limestone skeleton. Since ancient times, coral was well known and used for making jewelry or for decorative purposes. According to Ovid, the famous Roman poet, red coral came from the blood of Medusa, one of the Gorgons beheaded by Perseus. The Gorgons had the ability to petrify with their eyes, and the blood of Medusa, in contact with the foam created by the waves, petrified some algae that became red with blood. 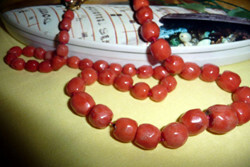 For centuries red coral has been harvested and used for many purposes, but mostly in the creation of jewelry; especially necklaces and bracelets. 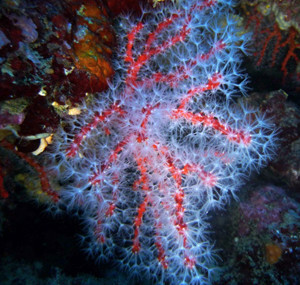 Because of its great commercial value red coral has been a victim of overfishing. One of the rudimentary techniques involved the use of an “ingegno” or "St. Andrew’s Cross", a wooden or metal cross-shaped tool with nets hanging along the four arms and ballasted at the center, which was towed by a boat along the seafloor or dropped on the wall. This technique was banned by the European Union in 1994 because in addition to the depletion of C. rubrum, it had also caused enormous damage to the whole coralligenous environment. Historically, red coral colonies could reach 50 cm in height and were quite common. Today, more than 90% of them, in areas under exploitation, can reach a maximum height of 5 cm and less than half are old enough to reproduce. Today red coral is collected by divers through much more selective fishing and with defined quantities regulated by the Ministry of Agriculture. However, other impacts continue to deplete this resource including fishing nets, boat anchors, pollution, sedimentation and climate change. 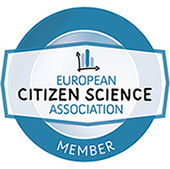 An increase in temperature for too long a period at the end of summer 1999 caused a mass mortality of many sessile organisms, particularly gorgonacea, along the coast of the Mediterranean Sea. For these reasons Reef Check Italy (RCI) has set up a campaign for the protection of Mediterranean gorgonians and red coral. For several years, reports of volunteer scuba divers have enhanced the RCI database, providing information vital to follow the changes that take place underwater, and to understand where the forest of sea fans and red coral are thinning or even disappearing. This knowledge is crucial to develop strategies and projects to protect these habitats and avoid undesirable cascading effects.